Sometime in the early 1970s, standout football players from Harris High School in Spruce Pine gathered to share tales of past glory on the field and be honored for their prowess on the field. Those honored included the Blue Devils shown here, who have been identified as follows. In the very front, left to right, are Paul Winters, Jimmy Pendley, Alfred Cornett, Buzzy Henline, and Roger Burleson. 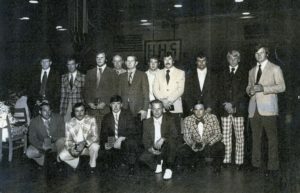 Standing in the first row, left to right, are David McCloud, Fred Medford, Herman Cornett, Guy Dale, Ronnie Rhyne, Fred Snipes, Chad Young, and Tony Dale. Standing behind the front row are Jack Boone and Hayden Duncan. Although the exact year this photo was made is not certain, it was prior to 1978, when Mitchell County consolidated its high schools, bringing students from Harris High (Spruce Pine), Bowman High (Bakersville), and Tipton Hill together for grades 9 to 12.